Apple's WWDC is going on and IOS 9 has been announced. So in this article we will tell you what all devices are supported by IOS 9. This year in Google I/O and Apple's WWDC, lots of nice things are announced. IOS 9 will run on all devices which supported and were compatible with previous version IOS 8 . 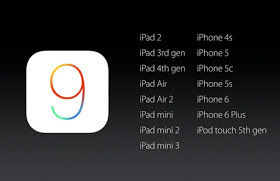 Below is the complete list of devices that will get IOS 9 update. As said in WWDC 2015 IOS 9 is sized less than the previous OS IOS 8. Currently the IOS 9 is available in developers preview and may take a while to be available through OTA. Stay tuned to get amazing updates.